ILSN: Tell us a little bit about yourself? Mandee: My name is Mandee, and I was born and raised in Canada! I’ve been watching anime and gaming since I was a small child. I thank my older brother for introducing me into the great nerd world. ILSN: What is the craziest story you could tell us? Mandee: When I was 15 years old taking the train in Japan, I was in a hurry and rushed onto the train. My arm got caught in the door and I couldn’t get it out. The train started to move and I thought my arm was going to get blown off. I kept pulling and was calling for help, but everyone just stared at me. The door opened slightly somehow and I fell backwards. Good thing I still have my arm haha. ILSN: Do you have any projects coming up? Mandee: Yes! I will have 3 new cosplays for the upcoming PAX Prime! ILSN: How did you get into doing cosplay costumes? Mandee: I’ve always wanted to cosplay because I’m such a big fan of anime, so eventually I ended up doing it, even if I did it alone haha. ILSN: What inspires you when you choose characters? Mandee: I’m not sure, I kind of just fall in love with the character and decide I want to cosplay them. ILSN: Marvel vs DC vs Anime? Mandee: ANIME hands down. Unfortunately, I never got into the comic book scene. ILSN: What was your childhood like growing up? Mandee: Quite normal; I went to school, played games, watched anime, ate food, and slept. I actually didn’t have very many friends, and found it difficult to relate to others in my class. ILSN: Where do you see yourself five years from now? Mandee: Haha I don’t know! Anything could happen really. I hope to still be doing cosplay. ILSN: What is the most interesting experience you have ever had at a CON? 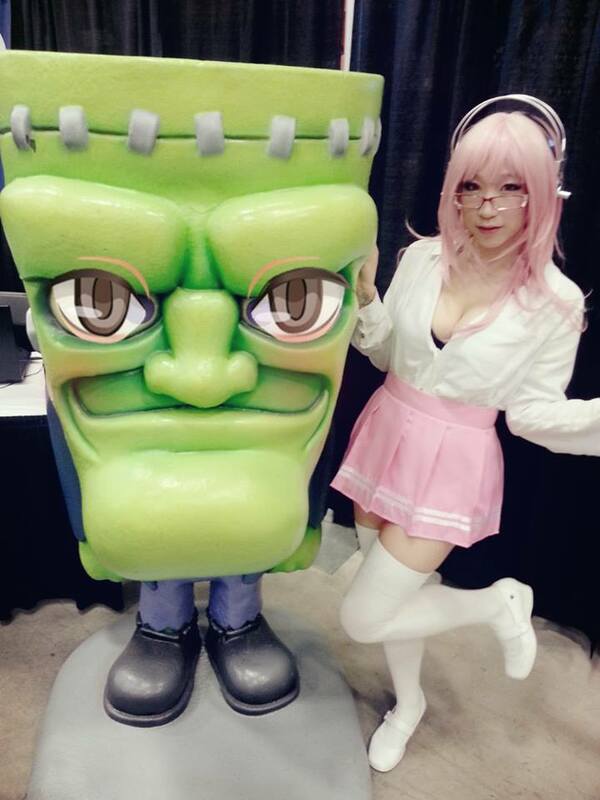 Mandee: The first time I went to a US con was Anime Expo (in 2013). I didn’t really know anyone there, and I had just gotten into cosplaying. When I entered the convention center I was rushed by so many people asking to take a photo of me/with me, and I was just standing there really surprised and posing badly haha. I even heard some hate comments about me, which made me feel disheartened. It all happened really fast, which was a cool experience. ILSN: What do you do to inspire yourself? Mandee: Watch anime? Haha. There’s so many things to cosplay! > ILSN: What do you like to do for fun? Mandee: Watch anime, play random games, eat waffles, surf the web, look at weird things on Ebay… the list goes on. ILSN: What kind of music do you like? Mandee: I mostly listen to EDM, but I listen to all kinds of music. ILSN: Is there anything you are promoting right now? Mandee: Business wise, no. But I am always promoting people to cosplay! Mandee: When I was into World of Warcraft, I really wanted the Netherwing drake mount, and the only way to get it is to be exalted reputation with Netherwing. So I did the daily quests everyday, and I memorized all the spawn points of the eggs and searched for them every hour/few hours so I can collect them and hand them in for rep. I did this for 20 days straight and got my Netherdrake. May not be my nerdiest thing, but I was pretty damn happy after I got it. ILSN: Do people ever recognize you when you go out? Mandee: Yes actually. One time someone recognized me at the mall and made an instagram post about it! ILSN: What is the craziest gift a fan has ever given you? Mandee: I haven’t received many gifts. I recently got a Kill la Kill charm from a cool person! ILSN: What is the hottest costume you have ever worn? Mandee: All my costumes are hot. Mandee: Wow this is hard haha. I really love Chrono Trigger for the Super Nintendo, as well as Super Mario RPG. I also really love the Final Fantasy series. This entry was posted in Nerd of the Month and tagged AnimeExpo, canada, cosplay, mandee sims, mandy sims by JW. Bookmark the permalink.